When in the market for a small sedan or hatchback, you should definitely consider Hyundai’s entry-level car (in the USA), the 2015 Accent! Just recently, Hyundai Motor America announced it has begun selling a slightly refreshed Accent model in the U.S. market. For the 2015 model year, the vehicle received some minor styling tweaks and equipment upgrades. Being the most affordable vehicle in the carmaker’s range, the Accent contiunes to deliver extraordinary value by blending utility, style and performance in a one package. There are many other reasons why you should put the Hyundai Accent a top of your new car shopping list, so let’s diwe into a list of 10 things you should know before buying. Here are some of the most important things you need to consider when buying a brand-new Accent sub-compact car. For the 2015 model year, the Accent continues to be available in two different body styles. You have a choice of a 4-door sedan (as pictured here) or 5-door hatchback. Hyundai Accent comes in a rainbow of colors. There are many “standard” paint shades available including white, black and gray, however, for the 2015 Hyundai has introduced 3 new exterior color choices (with the eye-catching “green” being included in the mix!). Find out more details about the 2015 Accent colors here. There are 3 different trim levels available including the GLS (4-door sedan), GS and Sport (5-door hatchback). Optionally, you can also choose the following packages: Popular Equipment Package, Style Package (both for the GLS sedan) and Power Sunroof Package (available on all three trim levels). Along with other details, Hyundai Motor America has also released pricing details of the new Accent. Generally speaking, the automaker has hiked the model’s starting price by $100, which is not that much considering all the tweaks and changes that the vehicle received. 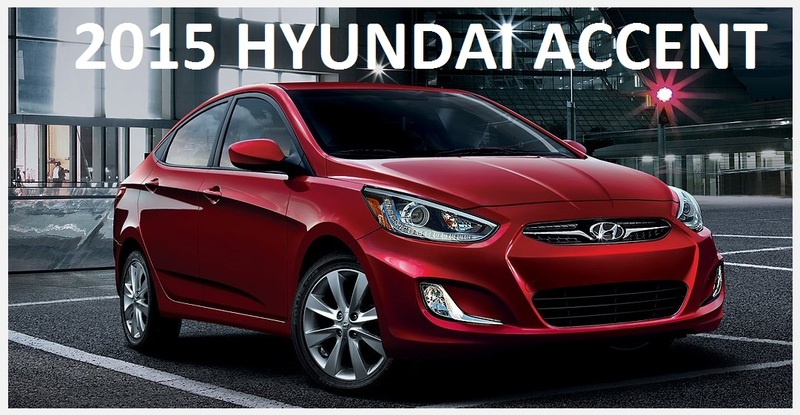 Follow this link to find exact details on 2015 Hyundai Accent MSRP prices. Hyundai’s award winning 1,6L GDI 4-cylinder engine is the only engine available in the Accent range. The highly-efficient powerplant, which generates 137-horsepower, can be mated to either a 6-speed manual or automatic transmission. You can compare the Accent’s 1,6L GDI engine specs to other rivals in a comparison chart here. 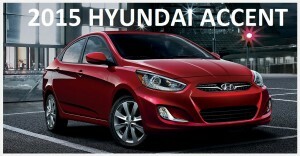 Each and every Hyundai car, includign the Accent 5-door hatchback and 4-door sedan, meet latest U.S. safety standards! You can find a large number of up-to-date safety systems fitted to this stylish compact car, which help protect the driver and passangers in an event of collision. Get more details on Hyundai Accent safety features here. There where a whole lot more changes being made to the 2015 version of the Hyundai Accent. We don’t cover them all in this introductionary blog post, so make sure you visit the “Accent changes” news page here to find out more details.